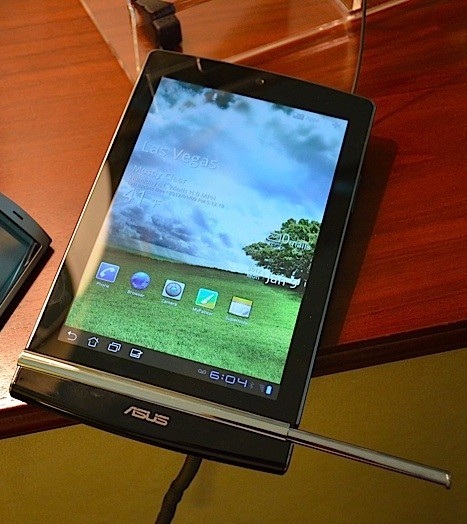 The new Transformer Prime wasn't the only shiny tablet that Asus revealed today. Asus is also going to be showing off a pair of MeMo tablets starting tomorrow, and Engadget got an early look. The tablet at right is the same MeMo that showed up last year, and it came to CES with a finalized set of specs and a release date. The eeePad MeMo171 sports a 7' (1,280x800) capacitive IPS screen, a dual core 1.2GHz Qualcomm CPU, 16GB or 32GB of Flash storage and Wifi/BT. It also has a pair of cameras (1.2MP and 5MP), g-sensor, proximity sensor, and GPS. Runtime is expected to be around 8.5 hours and it will run the latest release of Android v4.0 when it ships next quarter. And yes, that is a stylus sticking out to one side. Asus also showed off a demo unit for their next MeMo. They didn't release many details, but it's going to be running on a quad core Tegra 3 CPU and it will have an 8MP camera on the back. Other than that, the rest of the details are pretty vague. If and when it ships it will be running Android v4.0, but Asus has had a fairly long lead time on these tablets. Seriously, I could see Android 5.0 coming out before this tablet. Update: That second Memo tablet was outed by Nvidia as having a retail of $250. That's very good, if true. Asus still can’t make up its mind on this damn thing. Will there be one or two versions? I’ve seen contradictory reports. Ah, so no 4:3 screen after all. Dammit. Eh, this is probably like the Trasnformer, only Asus is showing off both the MeMo model they plan to sell this year alongside the one they plan to sell next year. Well, now we know what accounted for the confusion. Asus made a big splash at the Nvidia thing, stating they want to do this Tegra 3 7″ for a target price of $249. Before everyone gets so excited, remember that Asus’ original netbook never came in at the targeted $199. We’ll see what happens with this.